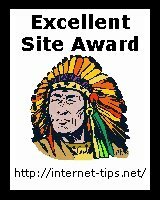 Thanks for applying for the Excellent Site award. Your site has met the criteria for the award and has won! I found your site is indeed excellent and I thoroughly enjoyed my visit. Thanks, Richard Lowe. Congratulations on winning JTs Gold Award of Excellence. Your site has met my criteria and I enjoyed visiting. Congrats you go the award! I love your site! THANKS A LOT! Jibs. Congratulations! My little dog JOSCHI and I have just visited your site, and we really like it. That means you have won Joschi's *Award of Excellence*. Congratulations!